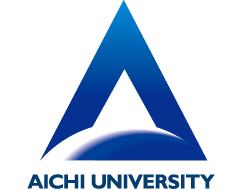 Our university’s name “Aichi” (愛: ai/love; 知: chi/wisdom) is derived from the Greek word “philosophia” (“philosophy” in English), which literally means the love (philia) of wisdom (sophia).The name therefore does not simply derive from Aichi Prefecture, even though the university is located in the prefecture. Aichi University was so named by its founders based on their sublime idea of making the university an edifice of leaning for people who love wisdom forever. The emblem of the university was designed by merging the two Chinese characters愛 (Ai) and大 (Dai) from “Aichi University” (愛知大学). This simple graphical representation expresses the university’s pride and resolution to continue its steady progress in keeping with its founding philosophy. The emblem was created in June 1947. Its original draft was made by Takasu Mitsuji (a Western-style painter who was a disciple of Ryusei Kishida). This mark represents Aichi University’ pledge to society that it will continue to be a university that nurtures and produces human resources who play active roles in the global arena, while creating new knowledge through advanced research and education. The mark is in the shape of the “A” of “Aichi University” resting on a sphere. The communication mark expresses the international and local communities to which the university strives to contribute. Our brand slogan reflects the fact that the name of Aichi University is derived from the phase “the love of wisdom,” and declares our determination to remain committed to “training individuals with global knowledge and perspectives” as stated in our founding philosophy. Along with the communication mark and the university logo, we will continue to use this brand slogan for a certain period of time in practicing public relations. The slogan will appear in our promotional materials featuring a design that inspires a sense of energy and using our university’s base color, Aichi University Blue, in order to help improve the brand image of the university.